Welcome to the Official TORA Board Game Website! 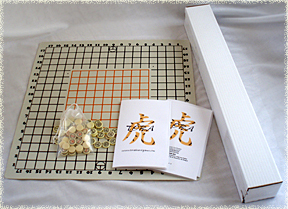 An image of the base set. The names, words, symbols, and graphics representing Ninja Nezumi Productions, L.L.C., TORA, TORA Seal of Approval, various TORA images, and other Ninja Nezumi Productions, L.L.C. properties, are either trademarks or copyrights of Ninja Nezumi Productions, L.L.C., protected by trademark and copyright laws 2004-2011. TORA Long Board, Short Board and the related tournament rules and scoring are protected by US Patents: US 7,182,341 B2, US 7,287,754 B2, with Canadian and Australian patents pending.